The "Take It!" 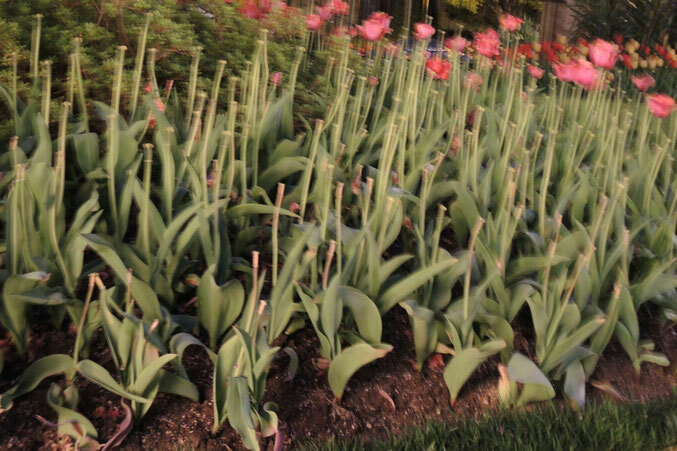 came a few days after these tulip stems were the support for their colorful flowers. The flowers had been the star of the show for a number of days when a rain storm came through that was accompanied by strong winds. The petals on the tulips just could not hold together against the wind and blew away. What was left standing were these all in green stems, still looking ready for duty. I think they all had a look of "What Happened!?" about them. Their being in such good shape and order, caught my eye as being an unusual opportunity to see a underside that is very necessary to put on the floral show that is the main attraction. The After Take: The next day - the gardeners had converged upon all the beds of flowers that had been stripped by the storm. Quickly the bulbs were taken out and I hope made ready to be used again next year. The new set of flowers planted look terrific, but somehow this image keeps coming to mind as a favorite show I had seen on the same setting some time ago. Here is to memory - it can serve us ever so well. I bet they were beautiful. Hopefully they rebloom. I just finished reading and noticed they were replanted. Hopefully the new ones shine bright. Must have been a rough storm!